President Donald Trump was in central Wisconsin Wednesday to help rally Wisconsin Republicans just under two weeks before Election Day. 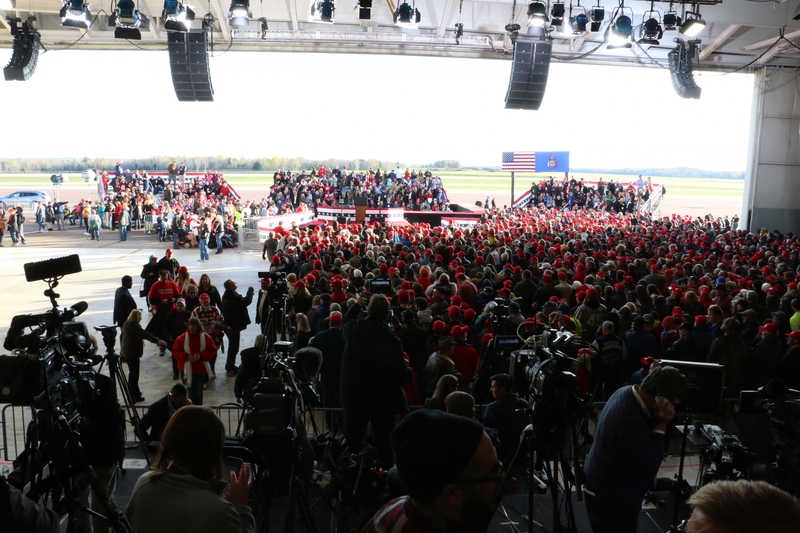 Part of the hope is Trump’s stop at the airport just south of Wausau in Mosinee will excite Republicans to get to the polls to vote for the state's GOP candidates, including Gov. Scott Walker and state Sen. Leah Vukmir. The attempted bomb attacks against Democratic officials, including former President Barack Obama and Hillary Clinton, as well as cable network CNN were front and center at the preshow of Trump's Wisconsin rally. House Speaker Paul Ryan, R-Janesville, and Walker both addressed the attempted attacks, with Ryan calling it an "act of terrorism" that has no place in the country's democracy. But other speakers still singled out Obama and the press in their remarks, prompting boos for the latter. The crowd also erupted into a familiar "Lock her up!" chant directed at Clinton, Trump's 2016 rival. The pipe bombs targeted a list of prominent Democrats but did not cause any injuries. The crowd of thousands was electric when Air Force One pulled up and Trump walked out. When he took the stage, he called on the country to come together after news of the bombs broke, but he still pointed a finger at the media. "We want all sides to come together in peace and harmony," Trump said as he kicked off the rally. But he said the media "has a responsibly to set a civil tone and to stop the endless hostility and constant negative and oftentimes false attacks and stories." Trump is calling for a new level of civility, saying those "engaged in the political arena" must "stop threatening political opponents as being morally defective." Trump has repeatedly blasted his political opponents as criminals and argued Democrats will destroy the country if they win control of Congress. Trump declined to go after his potential 2020 rivals Wednesday night, including former Vice President Joe Biden. Trump has been known to talk about how he would beat Biden in a fistfight. The president also refrained from mentioning his 2016 rival, Clinton, and Democratic Rep. Maxine Waters, two of his most frequent punching bags. Both women were targeted by suspicious packages. Mosinee has a population of 4,000, and Trump won that part of the state by double digits in 2016. Republicans in the state have been growing increasingly nervous about the prospects of holding onto the governor's office, let alone picking up a U.S. Senate seat held by a well-positioned Democratic incumbent: U.S. Sen. Tammy Baldwin. After starting his speech on the topic of civility, Trump pivoted to Walker and Vukmir. He said the "blue wave" wasn't going to come to fruition. "This will be the election of the caravans, Kavanaugh, law and order, tax cuts and common sense," Trump said, referencing newly appointed U.S. Supreme Court Justice Brett Kavanaugh and the migrant caravan where Central American migrants are making their way to the Mexico-United States border. Walker is being challenged by state schools Superintendent Tony Evers, a Democrat. The latest Marquette University Law School poll shows Walker leading Evers 47-46. During his speech, Trump called Walker up to the stage, where Walker said, "We’ve got a plan to keep moving Wisconsin forward and with this president he’s going to keep moving Wisconsin forward for generations to come. Thanks for the help Mr. President." The president touted Walker's record on cutting taxes and providing the incentives for Taiwanese manufacturer Foxconn to build a multi-billion dollar factory in Wisconsin. "Scott fights everyday for you, and now we need you to fight for him, and all you have to do is go out and vote," Trump said. 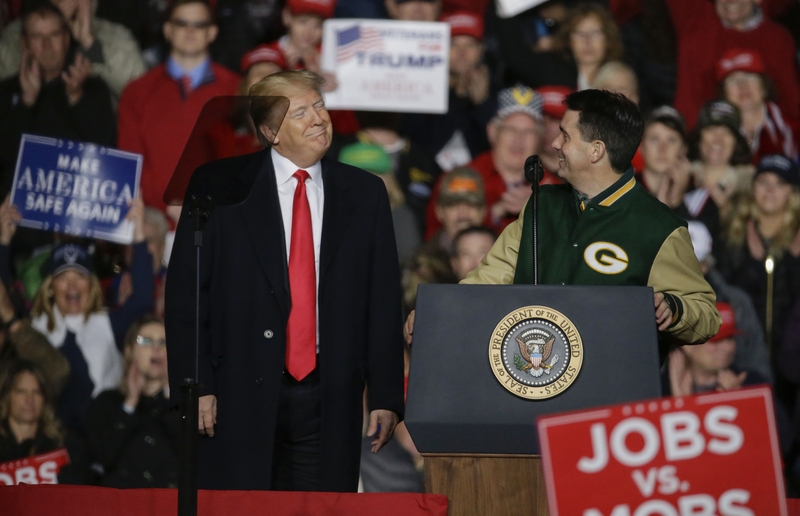 Before the rally Wednesday, Walker, tweeted he was going to give Trump a hat that reads "Make Dairy Great Again," as a thank you for "sticking up for Wisconsin's dairy farmers in the trade deal with Canada." After beckoning the governor to the stage, Trump welcomed Vukmir, who repeated a common campaign line on how Baldwin is for "open borders." 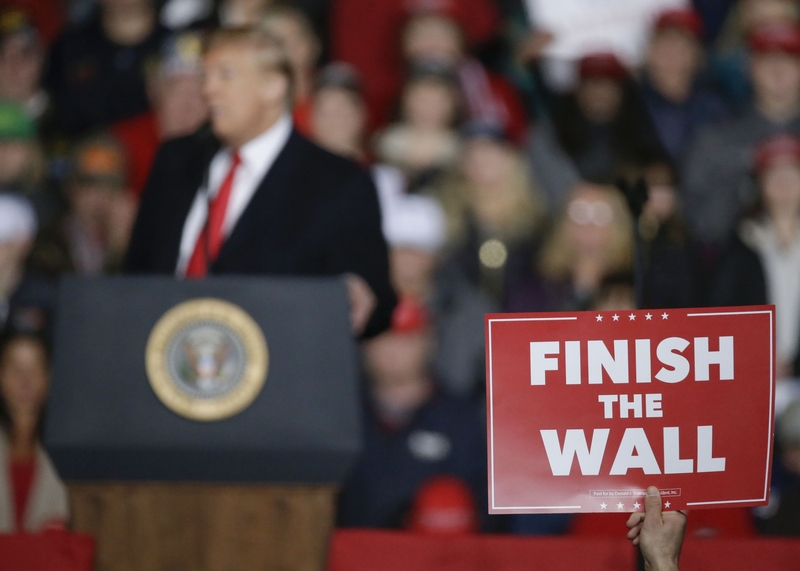 "We are a nation of laws and we must uphold those laws, and I want to stand with this president when he builds the wall and finishes building the wall," Vukmir said. The jam-packed crowd roared anytime a Republican speaker mentioned Kavanaugh or illegal immigration. The same Marquette poll that shows a tight governor's race shows Baldwin leading Vukmir 53-43 percent in the U.S. Senate race. Trump called Vukmir a "tireless fighter" who "will always vote for your Wisconsin values." 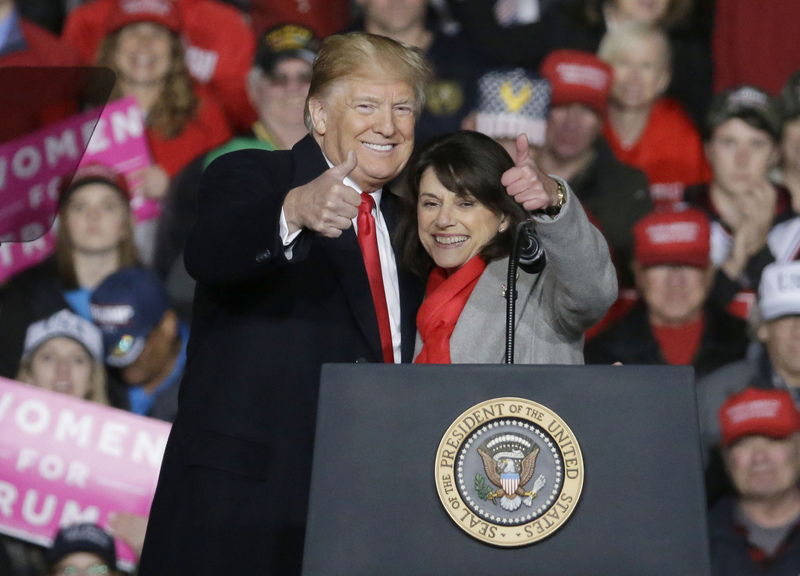 Trump encouraged the audience to support Vukmir, saying he needs more Republican senators to help pass his agenda in Washington and that she would be the perfect complement to U.S. Sen. Ron Johnson, a Republican from Wisconsin. Trump said he was trying to be nice as he criticized Baldwin following the attempted bombings. Trump claimed Baldwin is a "radical, far left opponent" who "wants a socialist takeover of health care." He added that he was holding back his most fiery rhetoric because he was "trying to be nice." Before the rally, Wisconsin Democrats held a press call with reporters to criticize the president ahead of his visit. "President Trump has made a whole lot of promises to the American public that he has failed miserably to keep, and Wisconsinites are being forced to pay the price," said U.S. Rep. Gwen Moore. Moore said those promises included cutting prescription drug costs and funding infrastructure projects in Wisconsin. "When you see President Trump promise that he's going to do the biggest and boldest infrastructure investment in American history and you're delivered a goose egg, it doesn't fix the roads and bridges and the schools and the broadband and the water delivery systems that we have in this state," said U.S. Rep. Mark Pocan on the call. Trump isn’t the only big hitter who has or is making an appearance in Wisconsin just weeks before the election. Vermont U.S. Sen. Bernie Sanders spent Monday in Milwaukee for the state's Democratic Party, urging people to get to the polls for the midterm elections Tuesday, Nov. 6. On Friday, Obama will be in Milwaukee stumping for the state’s Democratic candidates. And just hours before Trump’s rally, it was announced that former Vice President Biden will be in Madison and Milwaukee on Tuesday pushing for people to get to the ballot boxes. Editor's note: Laurel White and Andrea Anderson contributed to this report.